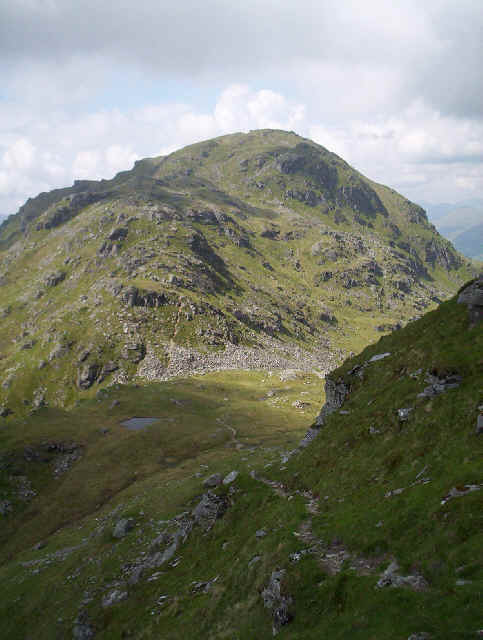 On the final day of my June 2008 walking holiday based in Tyndrum, I'd planned to climb Buchaille Etive Mor in Glen Coe. Boarding the Fort William bus the driver agreed to drop me off near the start of the walk. However, as we pulled out of Tyndrum the bus was stopped at a "Road Closed" sign. Sadly, there'd been a road accident on the A82 and the road was covered with diesel oil. The driver quickly informed us that the bus would be diverted via Connel Ferry and Ballachulish. About half a dozen people got off the bus; some with some rather serious logistical problems ahead of them. I dashed back to the hotel, grabbed my maps for Crianlarich and headed down to Tyndrum Lower to catch the train twenty minutes later. 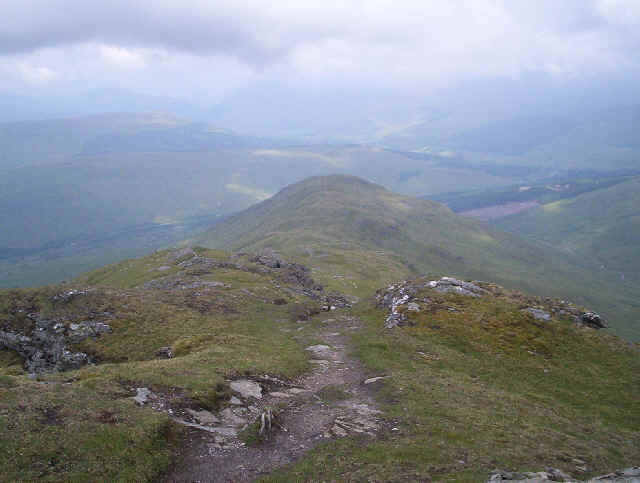 The revised plan was to go up two of the three Crianlarich hills that I'd not climbed before, An Caisteal and Beinn a'Chroin. 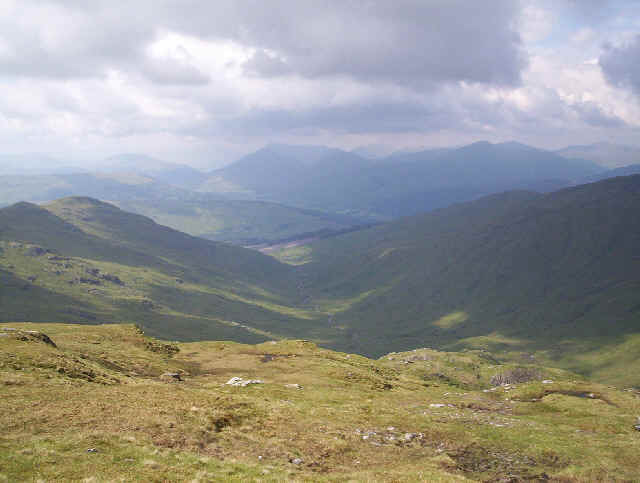 From Crianlarich station, it's a 25 minute walk along the broad grassy verges of the A82 to the car park at NN36947 23885. From the car park the track curves around under an railway underbridge. Don't be fooled by the newly surfaced road that crosses the railway at a gated level crossing just before the bridge. This has been built recently as part of the extensive engineering work on the West Highland line. 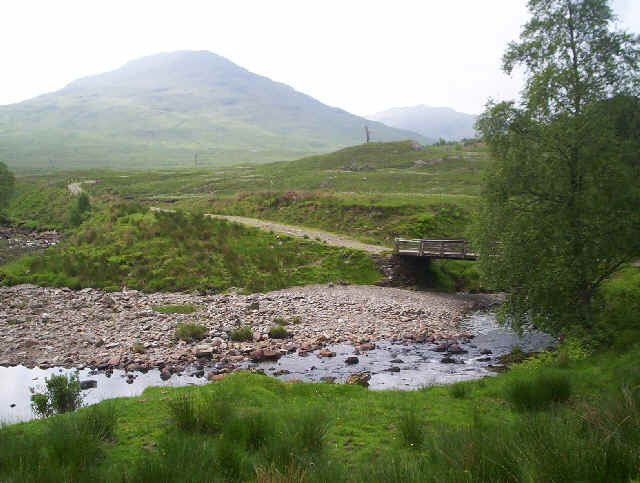 In the photo above, the bridge crosses the River Falloch with Sron Garbh, the day's first objective, in view. Some writers suggest heading straight up the ridge from here but, if you do that, you'll have to cross a fence with barbed wire on the top. Far better to continue up the vehicle track for a few hundred yards until you meet the fence and then head up the ridge. Guess which I did.....? 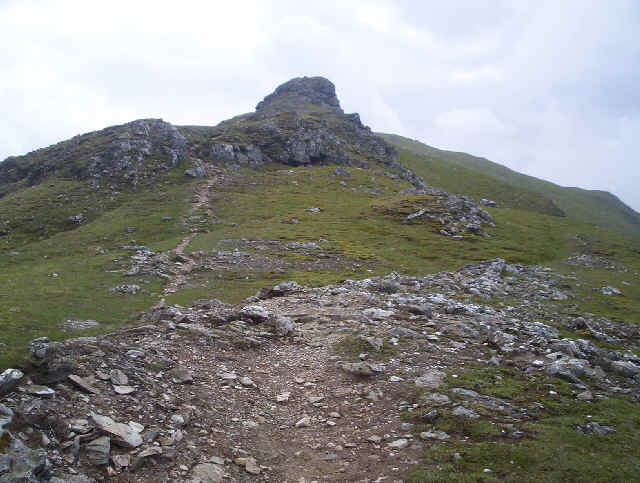 The climb up Sron Garbh is initially pathless but, soon enough, one appears and continues the whole way to the summit. 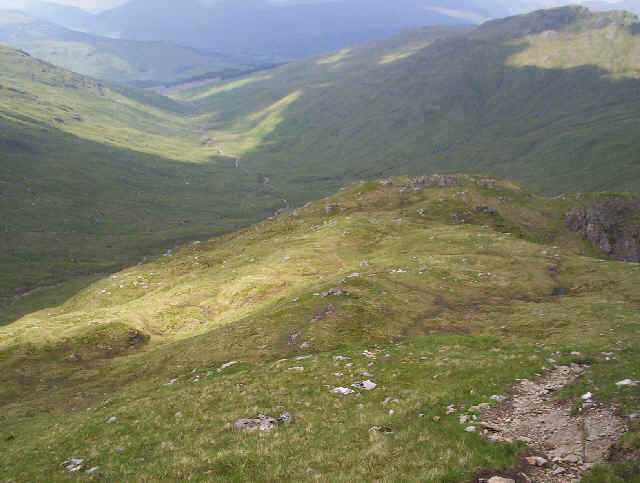 Here I'm looking downhill into Glen Falloch over the nose of Sron Garbh. The person in the photo is a lovely lady, from Stirling, who accompanied me up to the summit; nice to have a bit of company for a change. The mist kept swirling around but was promised to clear later. 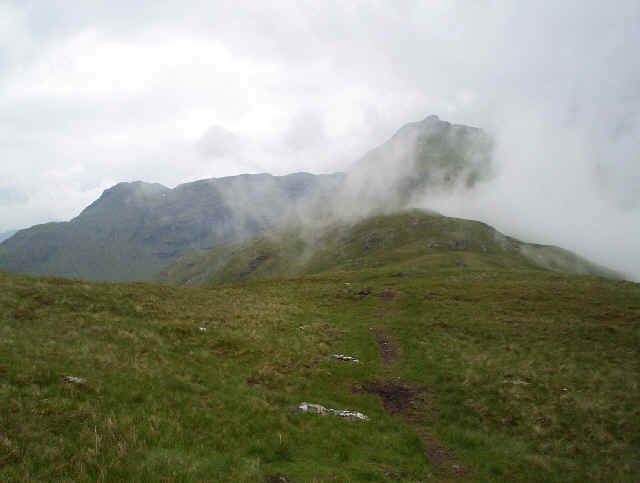 Here I'm crossing Twistin Hill with An Caisteal's summit peering through the mist. Beyond lies Beinn a'Chroin. 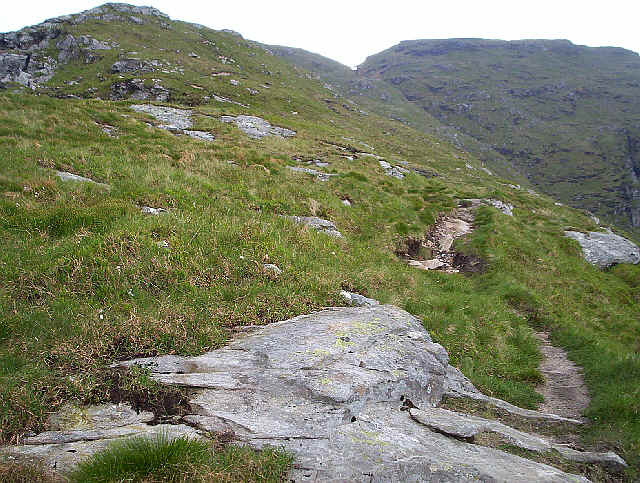 The climb to An Caisteal is not without the odd exciting moment, as it clambers up the crags on the east side of the hill. For those of a very nervous disposition I suspect there are alternative tracks away from the edge. .....crosses a small rocky ravine. It's an interesting section of path. 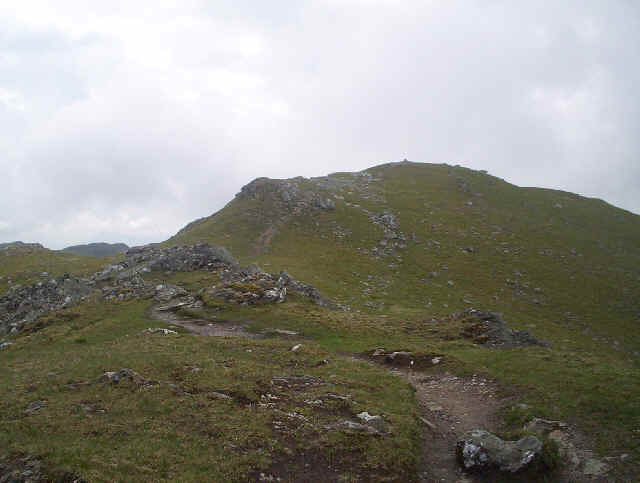 At last the summit is in view. The time taken from the road was about 3 hours with rather a lot of stops for photos and admiring the view. 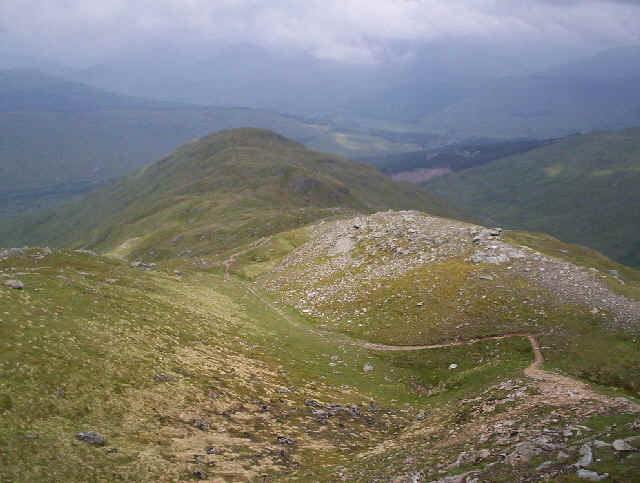 Looking back down the ridge from near the summit with Crianlarich in the distance. 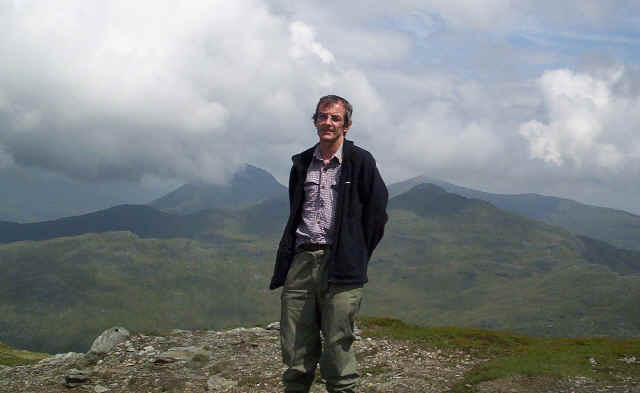 This is me at the summit; Ben More is in the cloud on the left and Stob Binnien on the right. After a rather long lunch break and sending a text to my wife to let her know where I was, it was time to continue down the rocky and sometimes scrambly path to Bealach Buidhe. By now the sun was out and it was a truly beautiful afternoon. 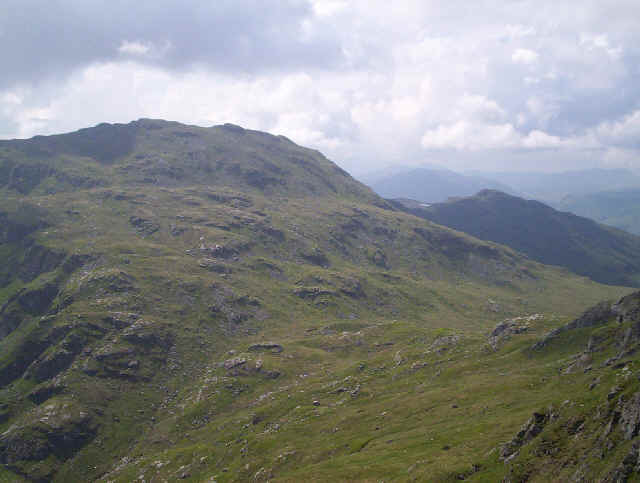 Beinn a'Chroin from An Caisteal's south eastern ridge. Mmm... Now how am I going to get up there? 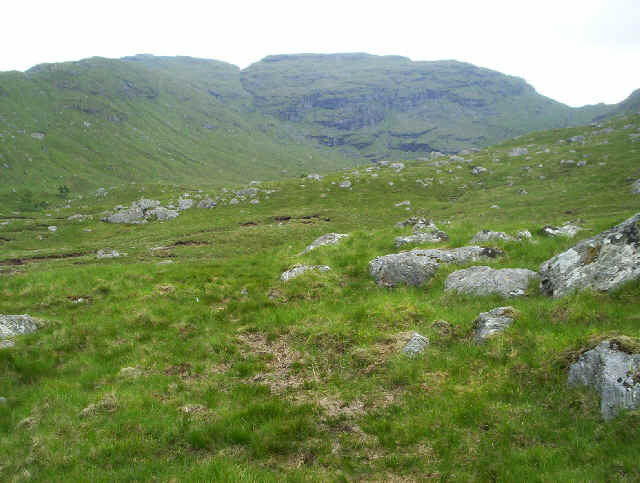 The photo is taken from Bealach Buidhe and shows the path beginning to clamber up the crags of Beinn a'Chroin. 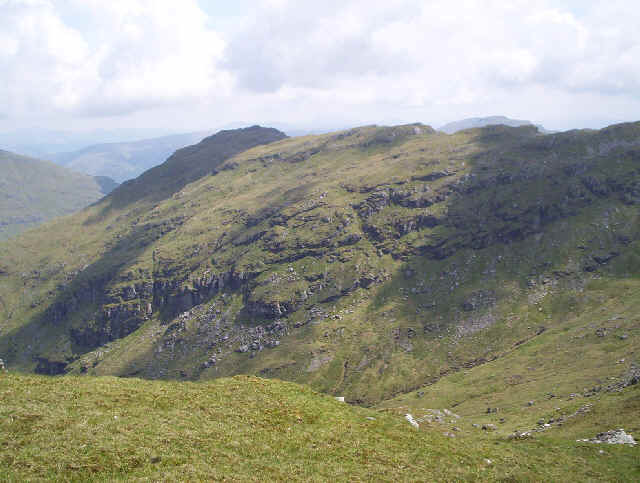 From the bealach this view is looking back to An Caisteal with the steep path clearly visible. 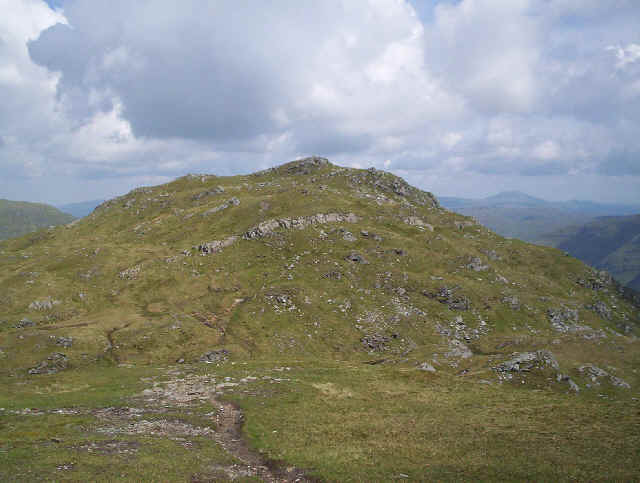 The only Munro in the Crianlarich area that I haven't climbed yet is Beinn Chabhair which, although it can be climbed from An Caisteal, seems better approached from Inverarnan on the A82. Another weekend trip up from Glasgow by Citylink I think. 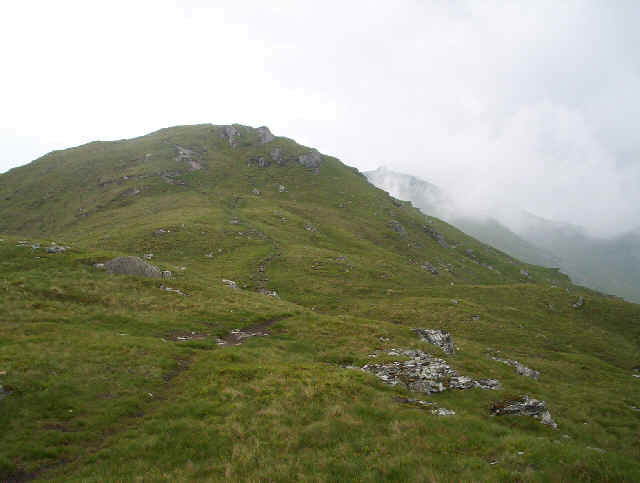 The path up Stuc a'Chroin starts deceptively easily but, higher up, requires a small amount of very awkward scrambling. I almost gave up at one stage because the foot and hand holds and exposure were stretching me beyond what I was comfortable with. Needless to say I've no photos of this section of the walk. I strapped my poles to my rucksack, pulled the straps really tight to get my centre of gravity forward as much as possible, and then heaved myself up three or four steps holding tightly onto the rocks. Not nice! I certainly wouldn't like to descend this path especially if the rocks were damp, but there again, I'm a bit of a coward! I certainly think that walkers with shorter legs than mine might have problems here. After those few awkward steps the path suddenly bursts - there's no other word for this utterly glorious moment - on to what I feel is one of the most delightful mountain tops I've ever been on. 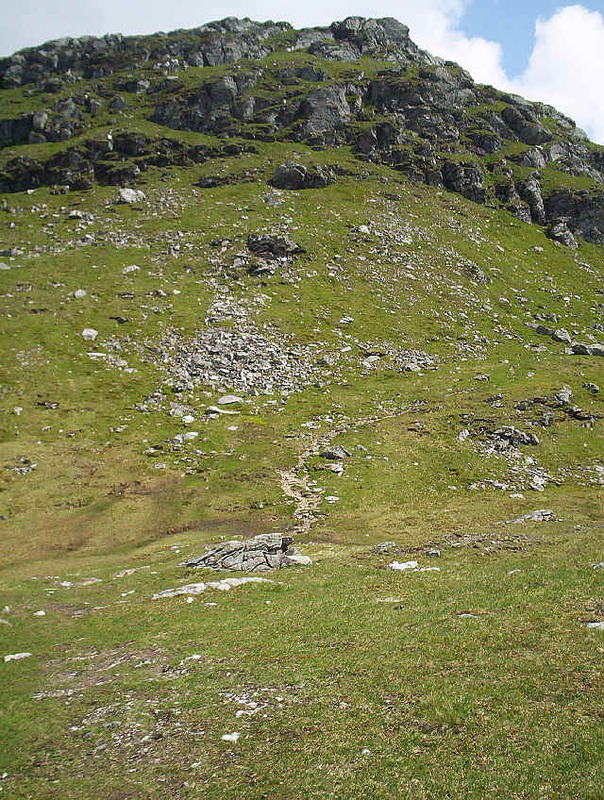 It's a fascinating walk across the various summits which, of course, have been the source of much discussion as to which is actually the highest. To be absolutely sure I went to the top of every possible one. The real summit is, apparently, that one in the distance; the east summit. 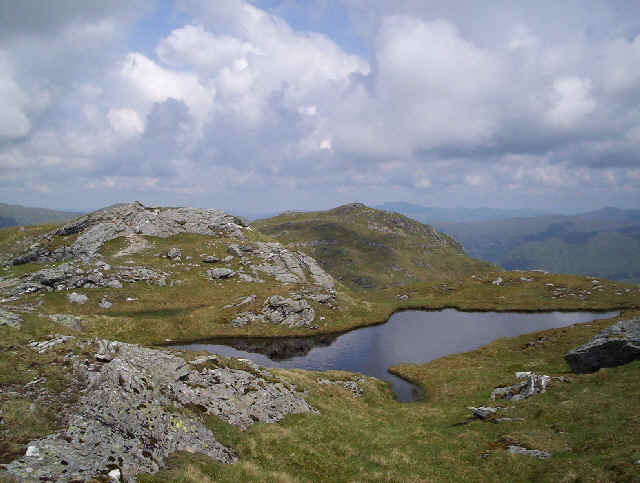 The hill top is littered with delightful scenes like this tiny lochan, or is it just a pool? Over another top, just in case. 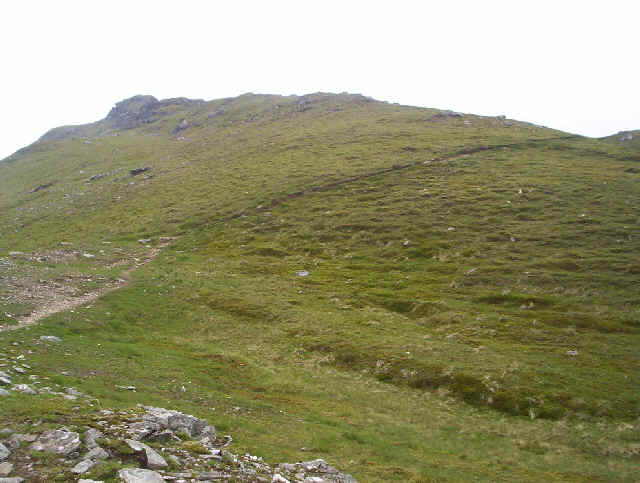 Finally one hour and forty minutes after leaving An Caisteal I arrived at the true summit. My walking poles were thrown down; I sent a SPOT satellite tracker message to my wife's mobile, as there was no Orange reception at the summit, and tucked in to some chocolate. Bliss - the sun was shining, there was no wind and the views - just look at the panoramic photos below. Click on the image to see the full size panorama. 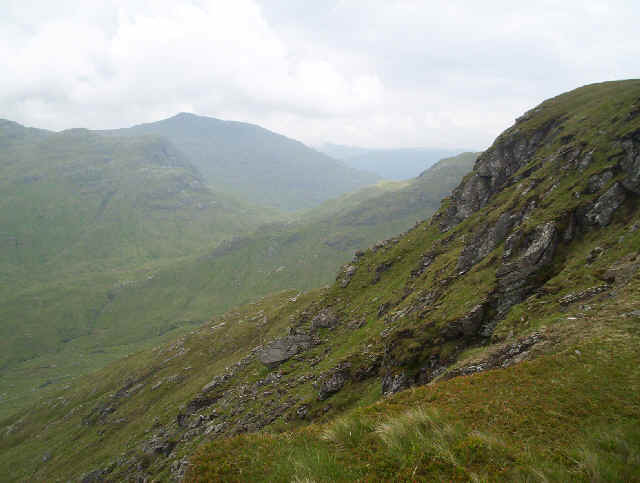 The image starts on the left with Ben More Stob Binnein and ends on the right back at Ben More. When the larger image appears in a new window click on it again to enlarge to full size. 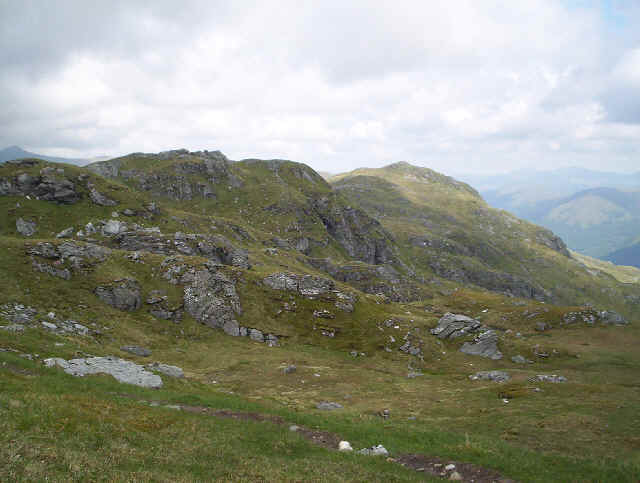 I set off at four o'clock back down Beinn a'Chroin's northern ridge. 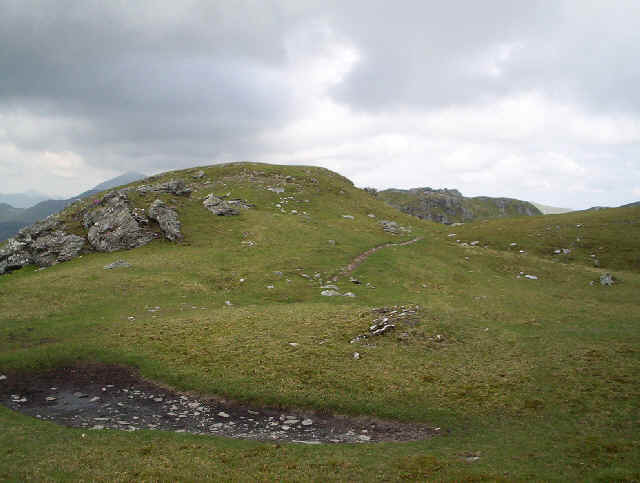 There's a clear although, in places, eroded path which leads straight downhill. 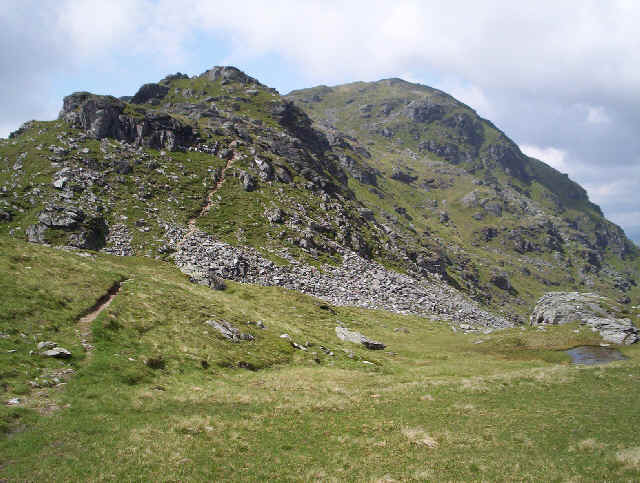 This would certainly be a good route out and back if you wanted to avoid the scrambling on the crags between An Caisteal and Beinn a'Chroin. 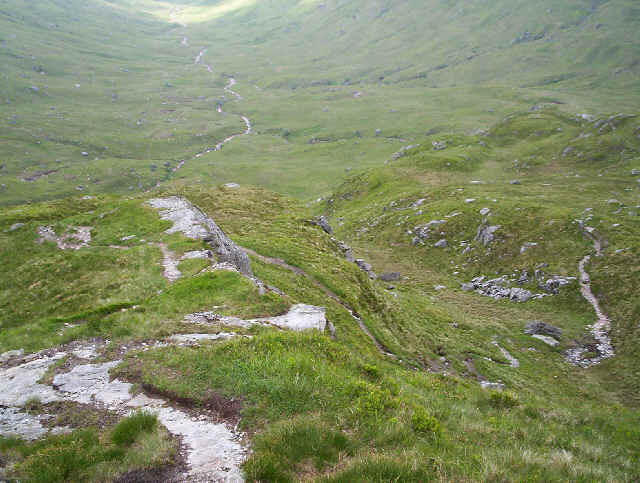 At one point the path appears to plunge over the edge of the ridge but it's not as steep as you might imagine. The past twists and turns in quite an entertaining way as it nears the valley floor. 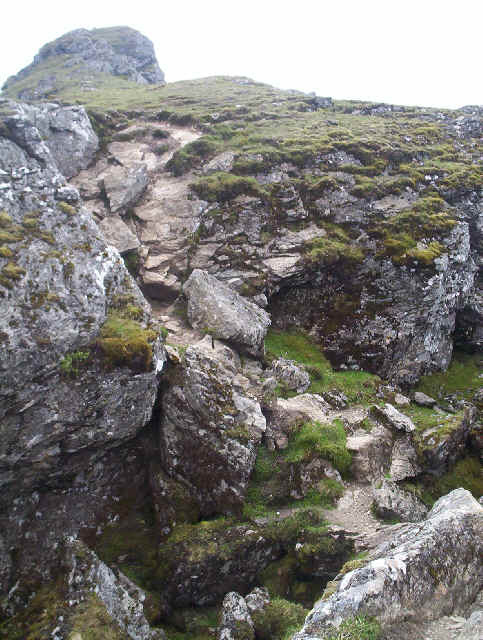 Once down in Coire Earb the walking changes totally. 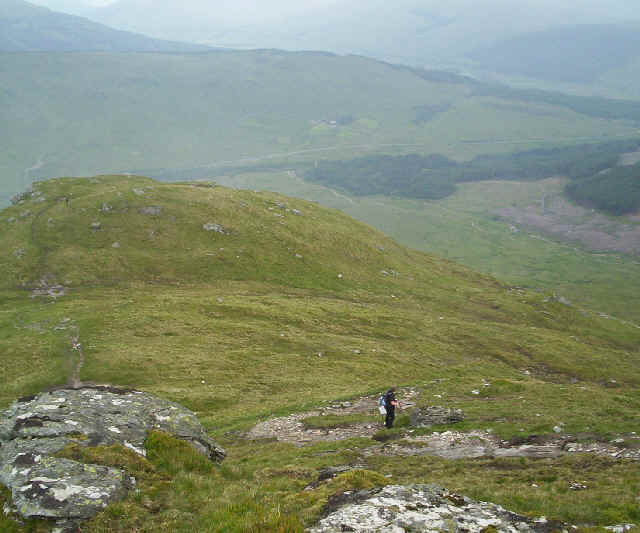 The valley of the River Falloch is boggy and the track, despite what the maps might suggest, is virtually invisible. Just keep heading down stream avoiding the wettest patches. In the dry conditions of June 2008 it was easy but I dread to think what it must be like when there's been weeks of rainfall. Eventually you'll arrive back at the vehicle track where you started the day. One final look back at Beinn a'Chroin. Now it was GPS on, to work out how long it was going to take me back to the A82 and then onto Crianlarich, for either the bus or the train back to Tyndrum. The choice was a minus five minute arrival time for the bus or an hour and a quarter's wait for the train. Let's just say I arrived at the bus stop in Crianlarich as the Fort William bus appeared round the corner! 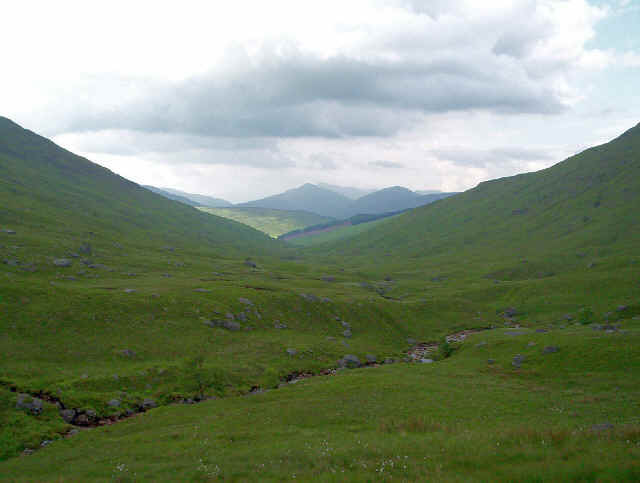 So ended my four day's walking around Tyndrum. 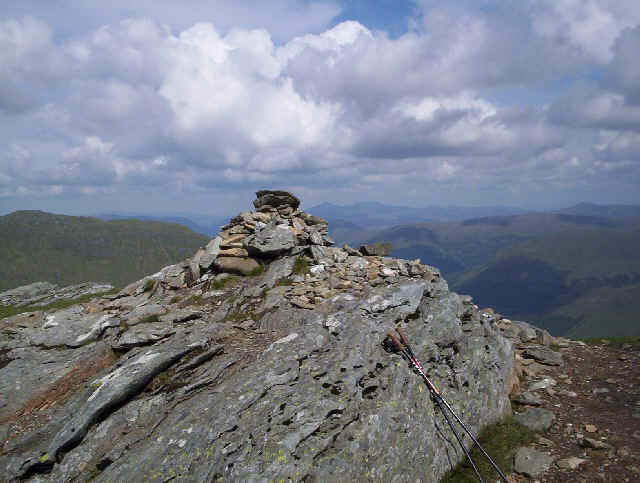 Ten more Munros ticked off and fantastic walking - even the midges weren't too bad.